Nefertiti meant "the beautiful (or perfect) woman has come"
Why Nefertiti was famous: Nefertiti was the Chief Wife of Akhenaten and the mother-in-law and stepmother of Tutankhamun, a beautiful woman forever captured in her portrait bust found at Tell el-Amarna. Biography and accomplishments: Nefertiti was the chief wife and consort of Amenhotep who would become known as Akhenaten, the Heretic Pharaoh. Nefertiti influenced and supported her husband in their religious revolution which changed Ancient Egypt from a polytheistic religion, with many gods, to monotheism (the worship of one god). The reasons for this radically change can only be guessed. Certainly the the priests of the Temple of Amun at Karnak had gained wealth and power and their authority challenged the role of the Pharaoh. The religious revolution totally reduced their power. Nefertiti was chief wife and consort of Amenhotep started their rule in Thebes. About 4 years into his reign Amenhotep, supported by Nefertiti, declared that all the old gods should be abandoned and replaced by a sole god - the Aten. Only Akhenaten and Nefertiti were allowed to directly worship the Aten. She changed her name to 'Neferneferuaten-Nefertiti' or 'The Aten is radiant because the-beautiful one has come'. And Nefertiti attained the power and status of a Pharaoh and co-ruler with Akhenaten. Her central role in the adoption of this new religion is witnessed in the artistic representations which adorn ancient temple walls. 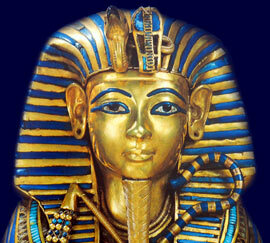 In year five of the reign the Pharaoh changed his name to Akhenaten. They started to build a new city called Amarna midway between Thebes and Memphis and in year seven of the reign the population of Thebes were forced to move to the new city of Amarna. Their rule became increasingly autocratic increasing the great resentment towards the new order even further. The influence of Nefertiti over Akhenaten decreased when sons were born to the Pharaoh's other wives one of whom was Tutankhamun. Nefertiti had only produced daughters but she arranged for her daughter Ankhesenpaaten to marry Tutankhamun ensuring that she would have considerable influence with the new Pharaoh. *There is some speculation that when Akhenaten died that Nefertiti assumed the sole role as the Pharaoh referred to as Smenkhkare Ankhetkheperure. The rule of Smenkhkare only lasted two years, the successor was Tutankhamun - was this pharaoh murdered? Each section of this Ancient Egyptian website addresses all topics and provides interesting facts and information about the Golden Age of Pharaohs and of Nefertiti. The Sitemap provides full details of all of the information and facts provided about the fascinating subject of the Ancient Egyptian Kings - their life, family, reign, dynasty, important dates and events and accomplishments.